1 oz Gold Australian Kangaroo/Nugget Coin - Random Year Coin - SKU #14. The obverse of these popular Gold coins bears a portrait of Queen Elizabeth II. 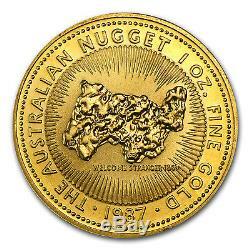 The image on the reverse of these Gold Kangaroo/Nuggets have undergone several changes since the Gold coin's release in 1987. 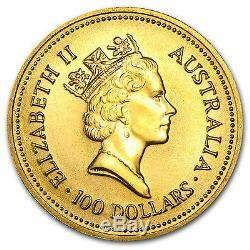 9999-fine Gold, the Gold Kangaroo/Nugget is the only major pure Gold bullion coin to change its reverse design annually. Dates and designs are of our choice and limited to stock on hand. Each package is fully insured. There are no exceptions to this rule. The UPS Store, or similar third party drop off locations. If you do not receive the package directly from the common carrier, you agree to take all reasonable actions to assist in recovery of the package, including but not limited to filling out reports (and/or police reports) and providing all information needed or that may be requested to assist in recovery of the package. If we determine the package is lost or damaged, we file a claim. Failure to fully cooperate will jeopardize coverage that may be provided to you. Prices and availability are subject to change without notice. Risks All investments involve risk; Coins and Bullion are no exception. The value of a Bullion Coin e. American Eagles or Canadian Maple Leafs is affected by many economic factors, including the current market price of Bullion, the perceived scarcity of the Coins and other factors. Some of these factors include the quality, and current demand and general market sentiment. Therefore, because both Bullion and Coins can go down in price as well as up, investing in them may not be suitable for everyone. Because all investments, including Bullion and Coins, can decline in value, you should understand them well, and have adequate cash reserves and disposable income before considering a Bullion or Coin investment. The term "Semi-Numismatic" means a Coin that has both Bullion and Numismatic value. No other relationship, including, without limitation, any agent-principal relationship, any employee-employer relationship, any franchisee-franchisor relationship, any joint venture relationship or any partnership relationship, between APMEX and you exists. You may not assign any of your rights or obligations under these T&C without the prior written consent of APMEX, which may be granted or withheld by APMEX in its sole discretion. This contract, including but not limited to the T&C, shall be binding on all permitted assigns and successors of APMEX and you. It is APMEX's goal that any disagreement or dispute be resolved expeditiously. If an amicable resolution cannot be reached, you agree that any and all disagreements and disputes between us shall be resolved in accordance with the following paragraphs: (a) Forum Selection and Governing Law. If you become aware that you may be required to make any disclosure of such information, including, without limitation, as a result of the receipt of a subpoena or other compulsory process, you shall promptly notify, in writing, APMEX and you shall cooperate, in good faith, with APMEX in obtaining a protective order or other appropriate relief, if any, with respect to such disclosure. The item "1 oz Gold Australian Kangaroo/Nugget Coin Random Year Coin SKU #14" is in sale since Thursday, February 04, 2016.